s c r a t c h questions how technology creates shortcuts to our basest impulses. Developed in collaboration with Marianne M Kim, this solo performance by Ravens will include various forms of action-based mark-making inspired by the kitsch phenomena surrounding cats on the internet. s c r a t c h looks at the vestigial response or evolutionary craving we are trying to satisfy when we watch (or post) cats on the internet. We are questioning how primal instincts are amplified within our ever-growing technology-provoked human behaviors. Video, wearable sculpture, and unexpected objects are folded into a cyborgian meditation on tools we use to calm our inner beasts. We’re looking at impermanence, anthropomorphism, and longing. We’re looking at isolation and points of contact. We’re looking at infinity and binaries. We’re looking at fish out of water. MARIANNE M KIM and JOSEPH RAVENS have been collaborating for over a decade on performance art and installations in galleries and public spaces around the world. Informed by technology and inspired by instinctual behaviors, we manifest abstract actions and compelling images that embrace the unexpected. JOSEPH RAVENS is founder and Director of Defibrillator Gallery, a non-profit arts organization with a focus on Performance Art. Ravens has presented his work throughout Asia, Europe, South America, and the US. He studied at the Gerrit Rietveld Academie in Amsterdam, Netherlands, and is a graduate of The School of the Art Institute of Chicago with a Masters of Fine Art in Performance. 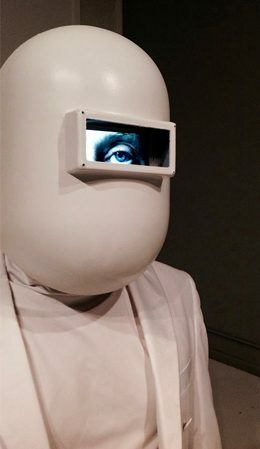 Ravens is a recipient of the Illinois Arts Council Fellowship for Performance Art, as well as the Fellowship for New Performance Forms, and other grants, awards, and opportunities that have allowed him to build an international reputation. Ravens was included in Live Biennale Vancouver (Canada 2015); 20th Bienal Internacional de Curitiba (Brazil 2013); Venice International Performance Art Week (Italy 2012); and Intrude: Art and Life 366 at Zendai MoMA, Shanghai (China 2008). Ravens is co-founder and director of Rapid Pulse International Performance Art Festival. He is recognized for his work as an artist, an educator, and a curator. MARIANNE M KIM is a Korean American artist and educator working in performance, public art, and multimedia installation. She received her MFA from UCLA’s Department of World Arts and Cultures with a focus on choreography and technology in 2004. She received her BS in Theatre from Northwestern University in 1993. Known for her work in Japanese Butoh and highly visual multimedia performance works, she has been produced throughout the United States and abroad. Her most recent work has been presented at The Singapore Arts Festival, Harlem Stage, Jumping Frames International Dance Video Festival in Hong Kong, Zendai MoMA in Shanghai, The Total Museum in Seoul, and Fundacion Ludwig de Cuba.